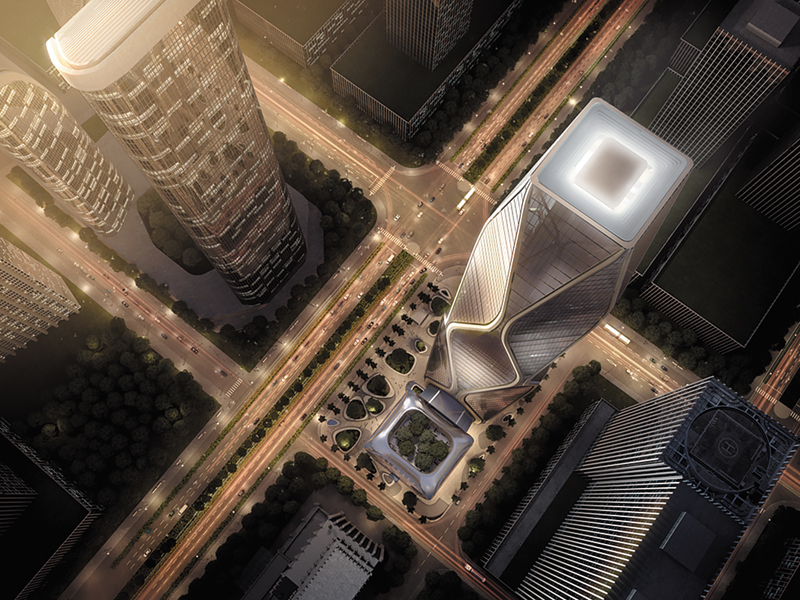 The tower’s expressive silhouette is the result of an integrated architectural and engineering solution. An efficient structural system minimizes wind loads, while creating highly flexible floor plates that accommodate the office and hotel program requirements. A central concrete core and sloping perimeter columns support composite steel floor framing and truss deck slabs. Eight corner mega-columns slope outward to open up large, flexible floor plates. As the corner columns move further apart, secondary perimeter columns branch out to maintain equal column bays. Above the lobby, a Vierendeel transfer truss transfers the secondary columns to the corner columns, creating an open lobby space below. At the tower’s crown, the primary corner columns extend upward to a truss at the top level. The crown consists of hangers and spandrels braced back to the central concrete core with a series of struts. These work in tandem to support MEP equipment, along with concealed building maintenance systems.